* Image that you are interested in estimating a binary response variable. * This is a binary response variable (i.e. one taking on a value of 0 or 1). * of an outcome approaches either 0 or 1. * present themselves as well. * is distributed with the probability density function of the normal distribution. * So this guides us on how to simulate a probit model accurately. * Generate number of family members. Poisson has the same mean and variance. * Add +1 to ensure that the minimum household size is 1. * First we generate the probability of selling at the market. * Then we calculate the probabilities using normal CDF. 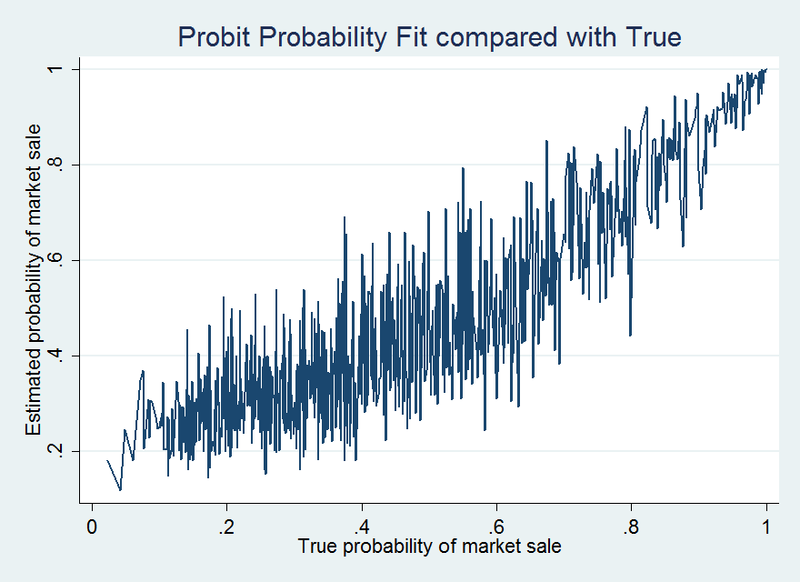 label var yhat "Estimated probability of market sale"
* Now, wait a second. These values look way too small! * But not so. Take a look at the normalization we did above. * Not exactly on but pretty close. * 1 out of 10 observations. * linear heteroskedastically robust OLS model.